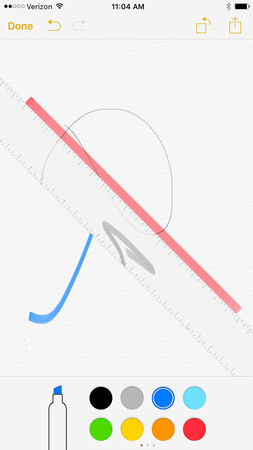 With the latest version of Notes in iOS 9, you can create a drawing to add to your note on your iPhone. This is a great feature that gives you the option to include an illustration. It’s also just kind of fun to play with if you’re in a jovial mood. With a note open, tap the Add button above the keyboard to display the shortcut toolbar. Tap the Drawing tool button (a squiggle near the right side of the toolbar). The drawing tools appear. Tap a drawing tool (Pen, Marker, or Pencil). Tap the Color button; the color palette appears. You have many colors to choose from. Tap a color and then draw on the screen using your finger. Don’t worry, not everyone is an artist. When you’ve finished drawing, tap Done. And you’re finished! Now you can send it off or just tuck it away for later use. 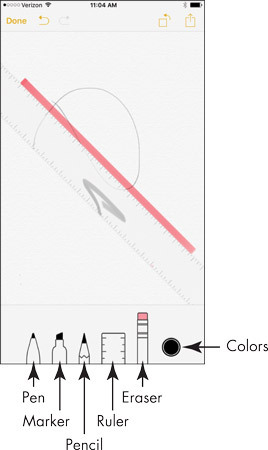 Tapping the Ruler tool places a ruler-shaped item on screen that you can use to help you to draw straight lines.